Anyway, back to Charles. Charles Wan Nian Bien was born on 16 October 1904, over a year after the twins Paul Bai Nian Bien and George Sung Nian Bien, and about two years after oldest son Richard Pang Nian Bien. Like his older brothers, between the ages of 1 and 8 he was raised in Yangzhou by family members while his parents were studying at Brown University in America. Unlike his three older brothers, however, he did not study in America right away. He graduated from Peiping Union Medical College, another missionary-funded school in Peking (now Beijing), in 1931, according to Chinese sources. He specialized in internal medicine and cardiology (卞万年, original text: “1931年毕业于北平协和医学院，擅长内科、心脏科”). 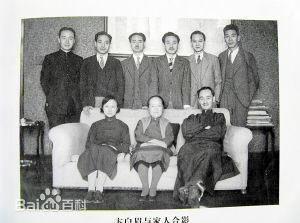 Sometime before 1936, he married, and he and his wife had three daughters: one born in Peking before his studies in America and two born in Tientsin (now Tianjin) after his return. In 1938, he came to America to study, entering at Seattle on 12 February (US entry paperwork). He had been working at Peiping Union Medical College and came to the US to study at Harvard Medical School, taking a year’s leave of absence from the university hospital (Peiping Union College Medical Hospital, 7). Interestingly, he did not return to Peking after his year of study, but moved with his family to Tientsin. The hospital in Peking had closed in 1941 due to World War II, so Charles and several of his colleagues began working at Sunnyside Hospital in Tiantsin (卞万年, original text: “1941年协和医院因战争原因关闭后，卞万年联络金显宅、卞学鉴、施锡恩、林崧、林必锦、关颂凯等人，到天津加入了陈善理的恩光医院”). The fun thing about researching Charles is the number of intriguing tidbits I’ve been able to find about his life. For instance, Charles was a Mason through Hykes Memorial lodge in Tientsin, accepted in October of 1947. This lodge was under the umbrella of the Grand Lodge of Massachusetts, which has chartered lodges all over the world. It’s possible that Charles’ other brothers were Masons as well – it was not a rare activity among Chinese students who studied in the US – but I have not found records of this, so if they were it must have been with lodges that were founded by Masons in other countries, such as an English Grand Lodge or a Philippine Grand Lodge. Another neat thing about Charles and his family is the house they lived in while living in Tientsin. At the time the area of Tientsin the house stands on was part of the British Concession on Dumbarton Road, which today is 57 Yun Nan Lu in Tientsin (Tianjin). It’s even marked on Google Maps as “The Former Residence of Bien Wannian” (Google Maps). It’s a notable home because it still survives from the 40s, and there are not a lot of foreign buildings that remain from that long ago in China. World War II damaged a lot of them, and the Chinese Civil War in the early 50s destroyed a lot more, especially in areas where the Communists took over and purged all foreign influences. The Cultural Revolution in the 60s and 70s continued this process. So the fact that this British-style building remains to this day is pretty spectacular. It’s also a stunning residence in and of itself, and it shows how well-off and prestigious Charles and his family were in 1940s China (Tianjin Historical Architecture Website). However, while Charles’ house was preserved, his life in China was not. The family left Tientsin – hours before the Communists arrived, according to a newspaper interview with Charles’ oldest daughter – at the end of 1948. They headed first to New York (US entry paperwork) and eventually settled in Vallejo, California (Independent Press-Telegram, 17 Mar 1957). His parents were living in Bakersfield with his brother Edward, while George was in La Jolla. Charles worked at Kaiser Foundation Hospital, according to the previously-linked newspaper interview. He became a naturalized citizen in 1956 and worked as a doctor for many years. The family moved to Glendale, California, where both Charles and his wife died in 1992: Charles died on 13 February 1992, while his wife died on 27 February. I don’t have any death information other than the date, so I don’t know whether their deaths were related, but I do know they were buried together in Vallejo. I am the youngest son of Charles Wan-Nien Bien and just found your blog. I have sent the links to my sisters, cousins and my children so they can read as if I passed on some family history to them. Thank you very much for posting your research, it has filled in a couple of memory blanks that my parents didn’t mention. Just that he also had a son (me) born 1947 in New York City when my mother accompanied my oldest sister while she studied for a year at Julliard. We went back to Tienstin but were only there for a short time before fleeing the Communist in 1948 as you have mentioned. Charles also treated General (Vinegar Joe) Stillwell, during WWII, and that connection also helped get us out of China on a military LST transport ship. My parents deaths were not related but just 10 days apart. Charles from pancreatic failure, Suzanne from heart failure, just short of their 60th wedding anniversary. A side note: I visited our Tientsin home with my parents and oldest sister in 1984. At that time it had 35 families living in the 35 rooms of the house.